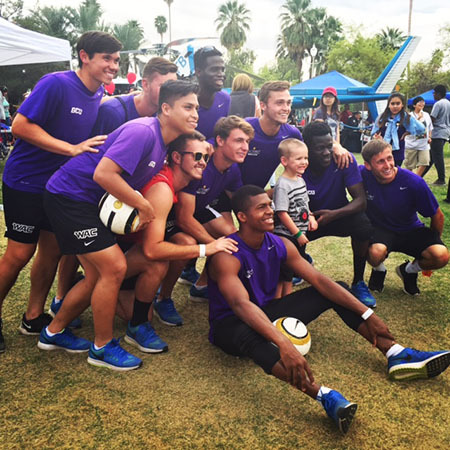 GCU soccer players encourage one of the children who enjoyed their involvement in the Phoenix Foster Carnival. It was a carnival Saturday morning at Enchanted Island Amusement Park in Phoenix, and everywhere you looked there were smiling children and families. Behind the balloons and cotton candy-filled faces, you would never think they were struggling — you would never think they were among the 2,000 kids getting one day outside of a life in foster care. 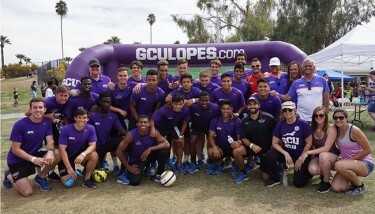 The GCU men’s soccer team was an enthusiastic supporter of the event. And in the midst of the crowd, the smell of grilled hot dogs and upbeat music came the sound of Grand Canyon University’s men’s soccer team, cheering on a group of youngsters as they lined up one by one to kick soccer balls into a large, inflatable soccer goal. The team of 20 stood alongside the goal dancing, laughing and high-fiving every youngster who approached them. 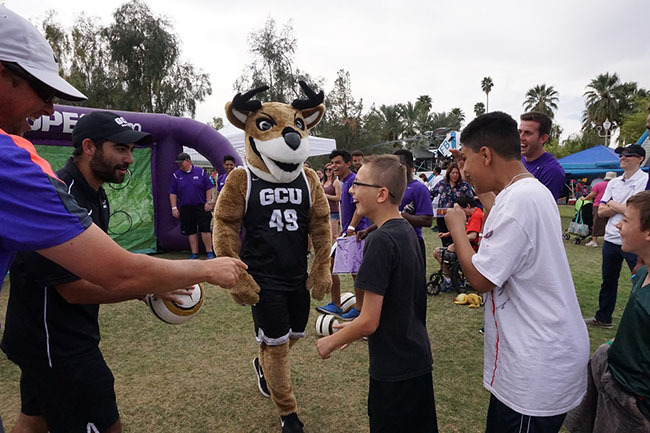 Thunder, GCU’s versatile mascot, played goalie for part of the day. Debbie Accomazzo, the University’s community outreach manager, said she was introduced to the Phoenix Foster Carnival this year and immediately knew she needed to contact the men’s soccer team. Coach Schellas Hyndman and his team were all in, even if it meant rescheduling a soccer match on that day. For one athlete, Musa Morris, the event touched home. Morris, 18, lost both of his parents during the civil war in Nigeria and lived in a refugee camp with five siblings and his stepmother before coming to Phoenix. “We were obviously struggling, so my stepmother believed America would give us freedom to start all over and that along the way God would help us find a better way of life,” Morris said. Growing up in Phoenix, Morris found comfort playing ball with the neighborhood children, and the local church helped him get back on his feet. Three years later, he joined a competitive club soccer league through the church — for the first time wearing the uniform of an athlete. No GCU event is complete without Thunder. “That’s when I realized that soccer was more than street ball. People here actually value the sport,” Morris said. 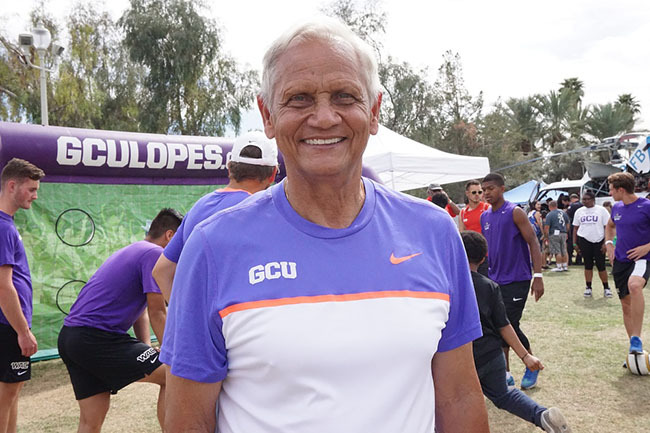 “It’s definitely weird looking back to the moment I got here and now playing soccer for GCU because I could’ve taken a long left turn in life — I could’ve been a party kid, I could’ve been doing drugs, or making bad decisions, but I got the second chance I needed,” Morris said. Morris is now rated as a three-star player by Top Drawer Soccer and ranked as the 74th best player in the country. He’s hoping to use the sport as a way to make a difference in the community. “When I come back out here and see the kids I grew up with, it really touches me because I wish they would get the same chance I got,” he said. “I wish someone out there does something for them. One of the best moments of the day was when one young child (in gray T-shirt) missed the ball and took a tumble. The players rushed to his aid. There are about 15,000 children in the Arizona foster care system, Accomazzo said.